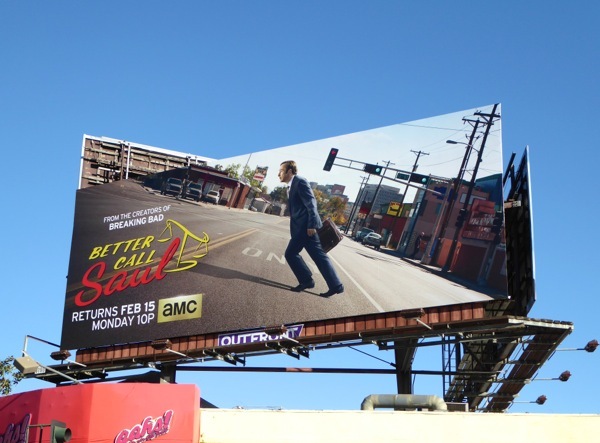 TV spin-offs are always a bit of a risky business, but Breaking Bad's prequel series, Better Call Saul, seems to have captured the imagination of both critics and audiences alike. 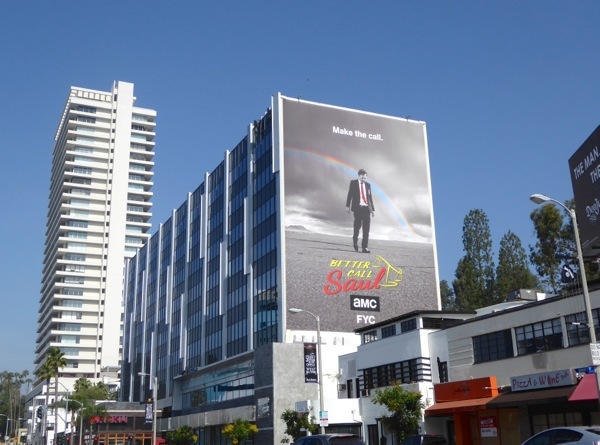 And just in case there were any doubters this season two key art really makes you take a second look at the drama with this wonderful optical illusion ad creative. 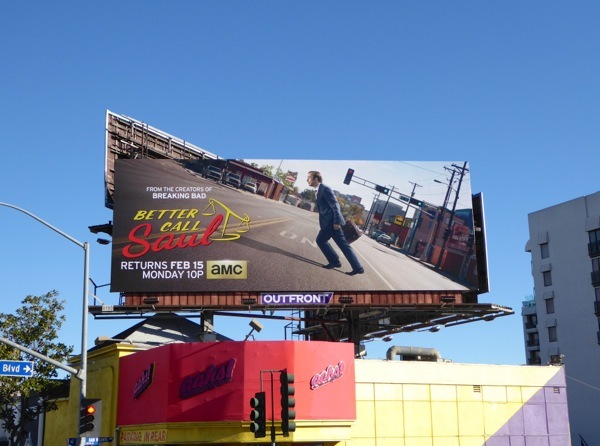 After being nominated for a Primetime Emmy and Golden Globe for Outstanding Lead Actor in a Drama Series, Bob Odenkirk returns as small-time lawyer 'Jimmy McGill', but following the events of the first season you have to wonder when his 'Saul Goodman' persona will rear his sleazy head. 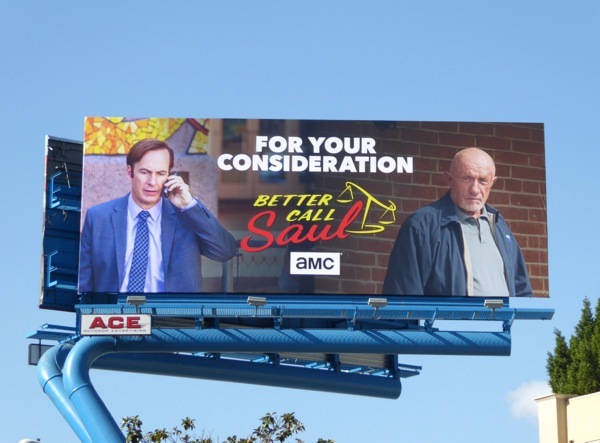 The other question that would certainly satisfy fans of the original series, is will we ever get to see a cameo by 'Walter White' or 'Jesse Pinkman' anytime soon? 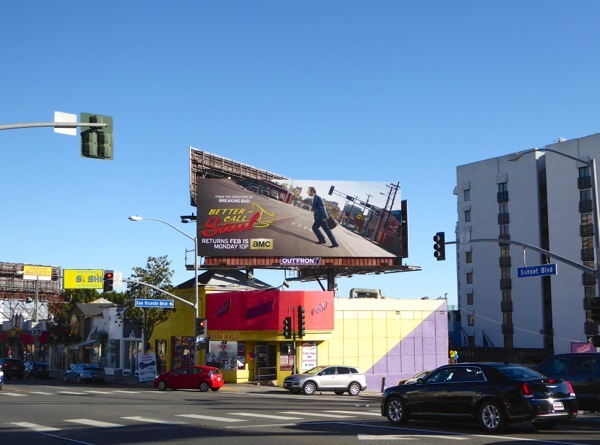 These perception-challenging season two billboards were first spied above West Hollywood's Sunset Strip on January, then spotted in other ad locations along Sunset Boulevard and Beverly Boulevard through January 21, 2016. 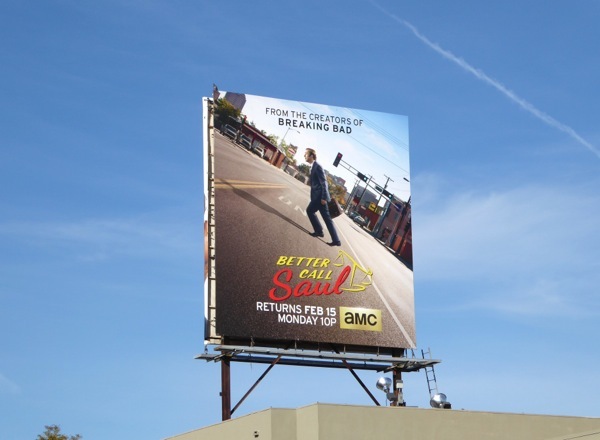 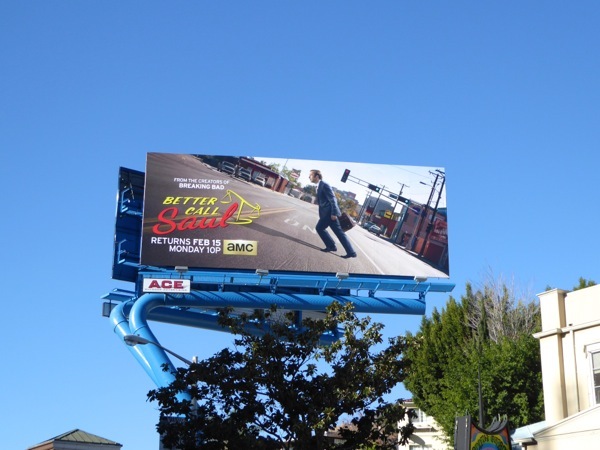 If you're a fan of the show, be sure to also check out these season one billboards for Better Call Saul and these Breaking Bad billboards where the character first appeared. 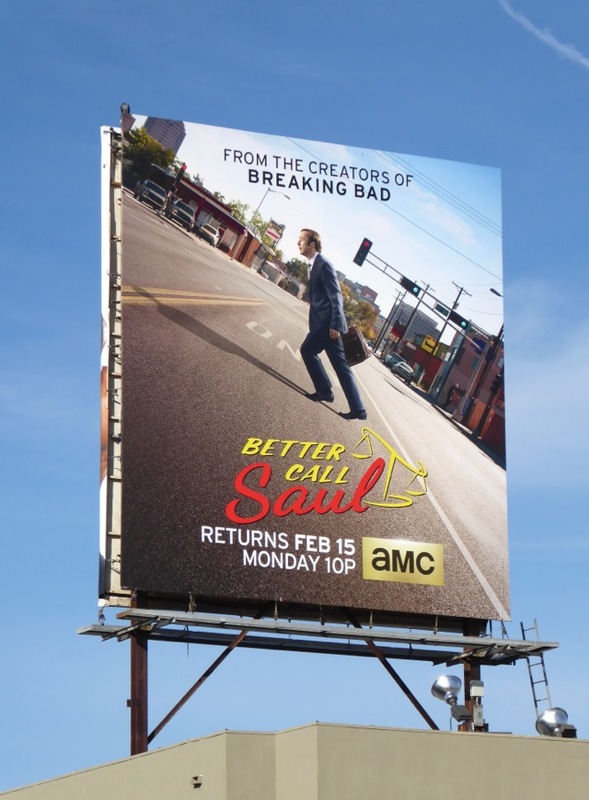 Whatever trials and tribulations lie ahead this sophomore season for the criminal lawyer, you can guarantee "S'all good, man!". 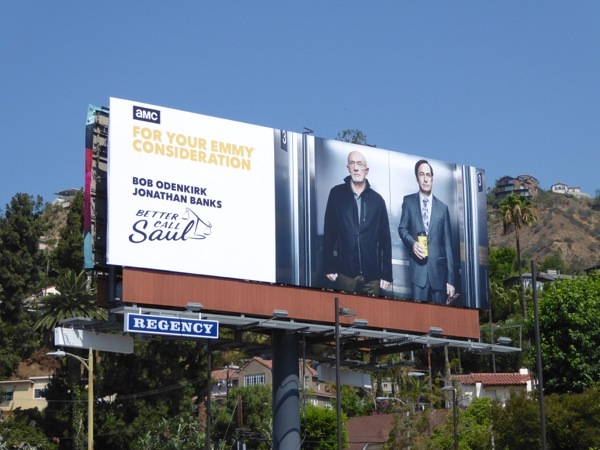 UPDATED: Here's also examples of the equally impressive Emmy consideration outdoor ad campaign for the series second season. 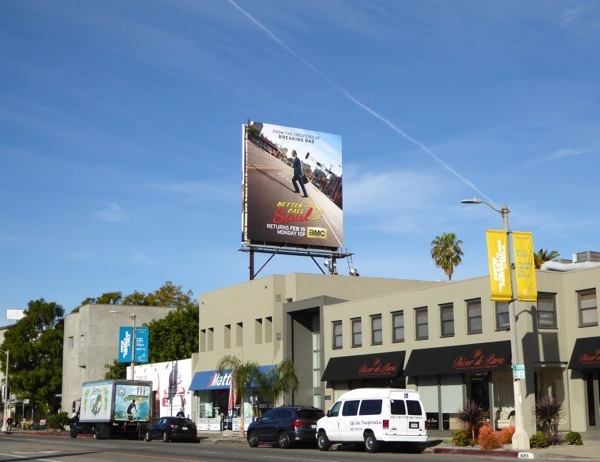 The giant-sized version was snapped along the Sunset Strip, whilst the standard landscape billboard was spotted along Fairfax Avenue at Pico Boulevard and the squarer ad format was spied above Beverly Boulevard on June 2, 2016. 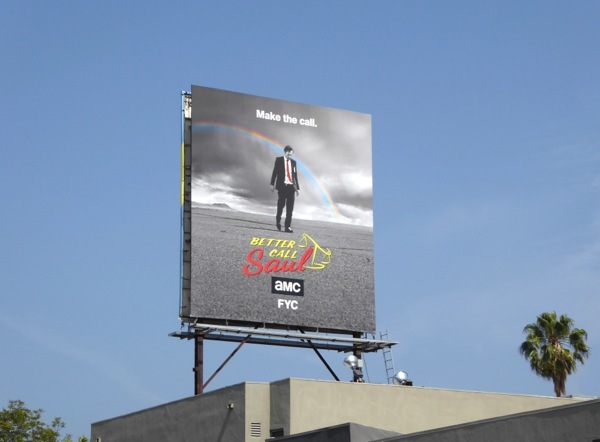 Let's see if they encourage TV Academy voters to 'Make the call' for the show. 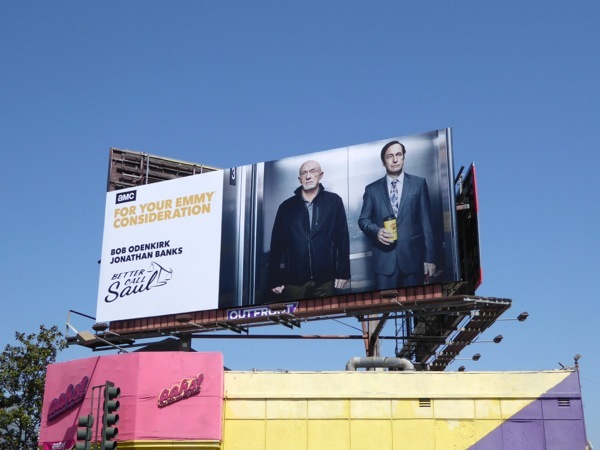 UPDATED: All those 'Make the call' ads paid off for Better Call Saul which garnered three Emmy nominations for its second season, including for Outstanding Drama Series and for Bob Odenkirk and Jonathan Banks. 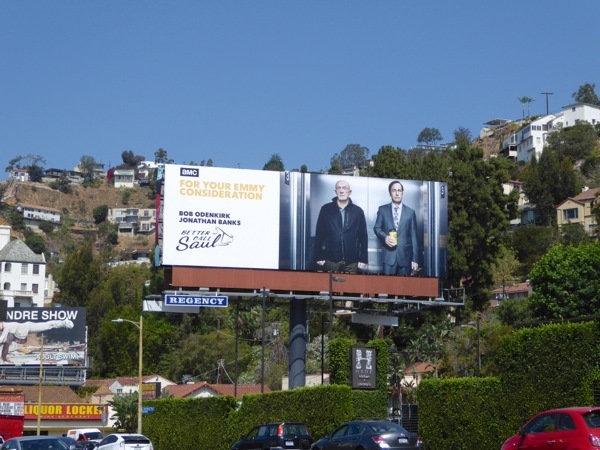 This Emmy nomination billboard featuring the two actors under consideration was spotted along West Hollywood's Sunset Strip on August 3, 2016. 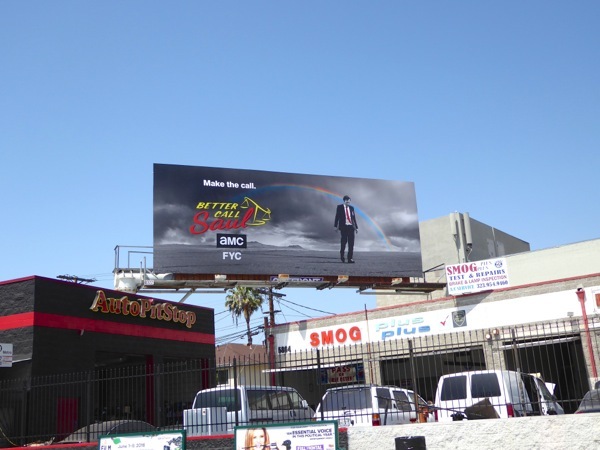 Plus another example was snapped further west along Sunset Boulevard the next day. 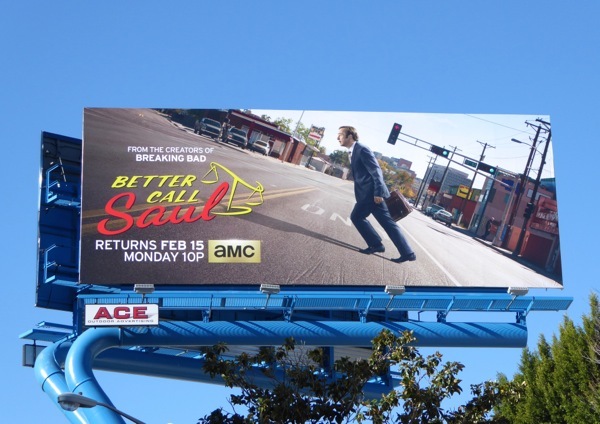 UPDATED: Better Call Saul's sophomore season may have nominated for six Emmys (and won none), but there's still time to win a Golden Globe, SAG Award or Critics' Choice Award. 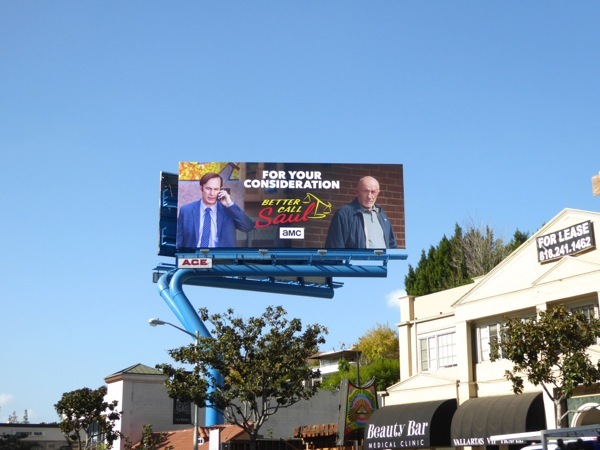 This awards consideration billboard was spied along West Hollywood's Sunset Strip on November 17, 2016.